United Financial Credit Union > Fraud Updates > Card Skimmers: What Are They? Card Skimmers: What Are They? There have been recent reports of card skimmers on devices in the Great Lakes Bay Region. Learn what to look for on the machines and how you can protect yourself. What is a skimming device? When it comes to protecting your identity and personal information, you can never be too careful. 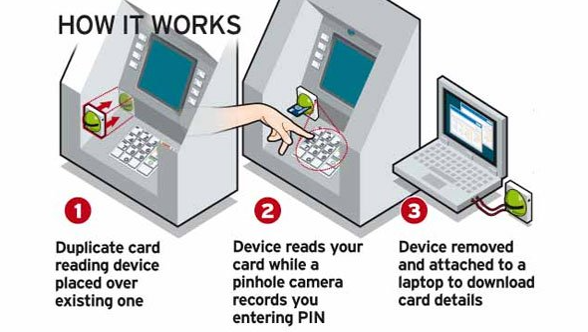 Thieves are placing realistic looking overlays on top of actual card readers so that when you swipe your card, both the skimming device and merchant terminal are reading your card information. They often use hidden cameras, laptops, or cell phones to record the PIN. The criminals usually leave the devices on the machines for short periods of time and then pry the device off and use the recorded information to create fake debit or credit cards, withdrawing thousands of dollars from accounts. You are vulnerable wherever you use your plastic cards. Inspect the card reader before inserting your card. Since skimmers are usually only on the machines for a matter of hours, they are often loosely attached. If there are loose parts, scratches, or something doesn’t seem right, DO NOT use the machine. Contact the financial institution right away, as well as law enforcement. Cover the keypad as you enter your personal information number and complete your transaction. Use a familiar ATM so you’ll be more likely to notice if something looks unusual. 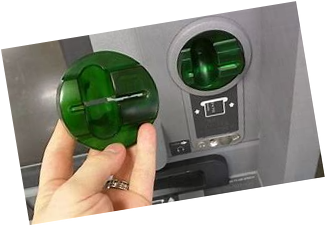 Thieves are less likely to attach the skimmers to card readers where there is a lot of traffic since someone might notice them altering the machine. Monitor your account. View online statements on a frequent basis and report any suspicious activity immediately. Continue to monitor your statements on an ongoing basis. Keep your contact information up-to-date so that we may contact you if we identify any suspicious activity on your account. If you think your plastic card has been compromised, please contact United Financial Credit Union at (989) 776-3620.